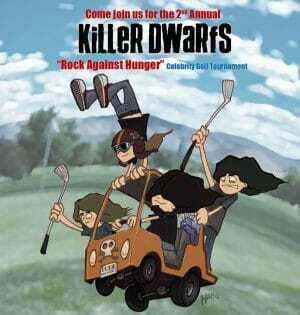 Canadian hair metal rockers Killer Dwarfs are hosting their second annual “Rock Against Hunger” celebrity golf tournament on August 26, 2016, which will be held at the Lakerige Links and Whispering Ridge Golf Course in Brooklin, Ontario, Canada. Last years tournament raised over $2,000 for Feed The Need in Durham. Price Includes: Golf, Cart, Driving Range, BBQ Lunch, Dinner, and Prizes.